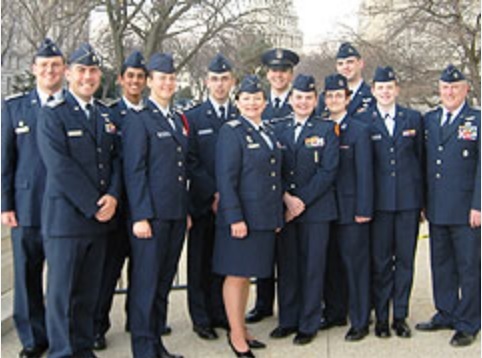 3/9/2006–BALTIMORE, MD–Members of the Maryland Wing of the Civil Air Patrol (CAP) visited offices of the state’s federal lawmakers on Capitol Hill in Washington, D.C. on March 2 as part of CAP’s annual Legislative Day. The annual event provides CAP leadership an opportunity to talk one-on-one with their Congressional representatives about the future of CAP operations, past-year accomplishments, and organizational funding requirements. “This is all about our three missions,” said CAP’s national commander, Maj. Gen. Antonio J. Pineda, at a briefing prior to the meetings, referring to CAP’s emergency services, cadet programs, and aerospace education roles. Two teams, one led by Col. Kay Joslin Walling, at the time the commander of the wing, and another by Col. Larry Trick, a former wing commander, delivered copies of CAP’s 2005 Annual Report to Congress to the offices of the eight Maryland members of the House of Representatives and two U.S. senators. A highlight of every discussion was the Civil Air Patrol Homeland Security Benefit Act (H.R. 1393 and S 649), which CAP hopes will be passed to extend the Public Safety Officer’s Act to CAP members killed or totally and permanently disabled while on assigned Air Force missions. In addition to Walling and Trick, members who participated were Maj. Robert Couch of Rockville, Maj. Wes LaPre of Huntingtown, Capt. Michael Crockett of Salisbury, Capt. Joe Winter of Baltimore, and 1st Lt. Steven Solomon of Silver Spring. Cadet members who participated were Haley Blevins of Lexington Park, Rachel E. Donoho of Arnold, Matthew Herten of Lusby, Syed Mohammed Karim of Gaithersburg, Sascha Maraj of Rockville, Elizabeth Peters of Bel Air, Jacob A. Reed of Westminster, Dalton Smith of Glen Burnie, Jonathan Smythe of Owings, Colleen Vineer of Rockville, and Arras Wiedorn of Severna Park. Some of the wing’s cadets also assisted other wing commanders, including Hawaii’s, Minnesota’s, Nebraska’s, Nevada’s, and Oklahoma’s by visiting their members of Congress with them. Maryland CAP members who participated were also given a special tour of the Capitol by a member of the staff of U.S. Rep. Wayne Gilchrest (R-1), who showed them the Capitol Rotunda, Capitol Crypt, and Statuary Hall. CAP, the official auxiliary of the U.S. Air Force, is a nonprofit organization with more than 60,000 members nationwide. CAP volunteers perform 95 percent of continental U.S. inland search and rescue missions as tasked by the Air Force Rescue Coordination Center and also perform homeland security, disaster relief and counterdrug missions at the request of federal, state, and local agencies. Members take a leading role in aerospace education and serve as mentors to the almost 25,000 young people currently participating in the CAP Cadet Program. CAP’s cadet programs provide young men and women with a safe and motivating environment in which to grow and explore opportunities in the military and aviation industries. Cadets progress through a 16-step program of leadership and aerospace education. CAP has been performing missions for America for 65 years. There are approximately 1,300 members of CAP in Maryland. Last fiscal year wing members flew 34 search and rescue missions and were credited with 23 finds. Be the first to comment on "MDWG Civil Air Patrol Members Visit Congress"